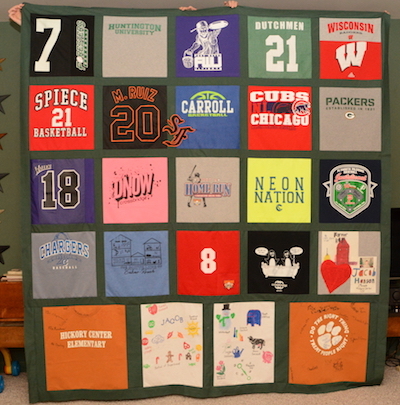 After finishing the 4 baby quilt tops, it was time to move on to a t-shirt quilt. A longarm quilting friend asked if I’d put the t-shirt top together, and she will do the quilting. The client wanted green sashing with no corner stones. As mentioned in a previous post, I like to use corner stones to help keep the blocks all lined up nice and straight. It just seems more time consuming to me to match up blocks from row to row without the use of corner stones. Here’s how I solved that problem. Mark a chalk line from sewn seam on to sashing. Pin next row matching seams with drawn chalk line. 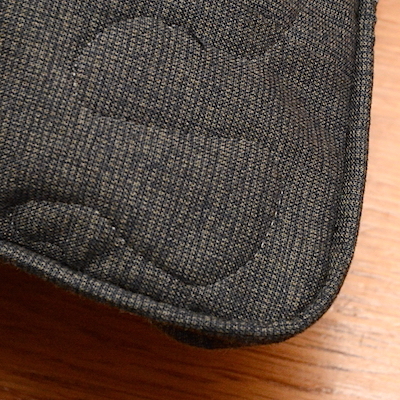 Stitch seam, aligning blocks up nice and straight. Rows all lined up with out corner stones. And ready to head back to the longarm quilter. 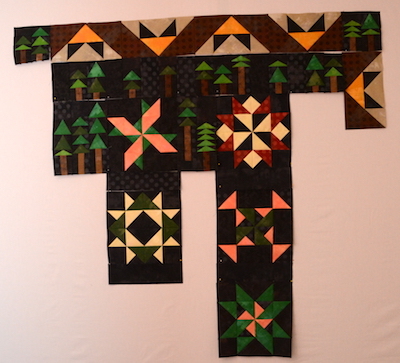 Mystery quilt: making a little progress with more trees pieced, and 2 more blocks pieced. Finish up one more baby quilt for charity. ✔️ I have a total of 4 tops completed. Keep working on Mystery quilt. ✔️ Slow going, but progress. Finish piecing Mystery quilt top. 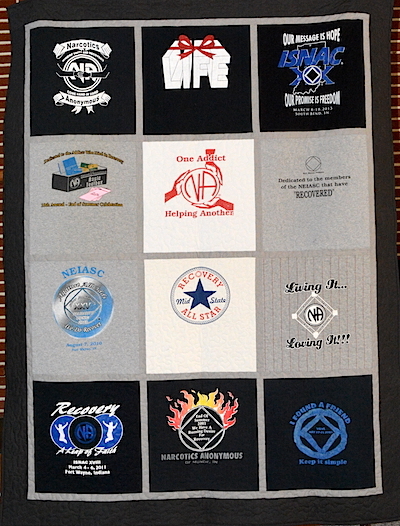 Yesterday I picked up the t-shirt quilt I’ve been working on from the longarmer. Today I squared up the quilt, cut and attached binding. 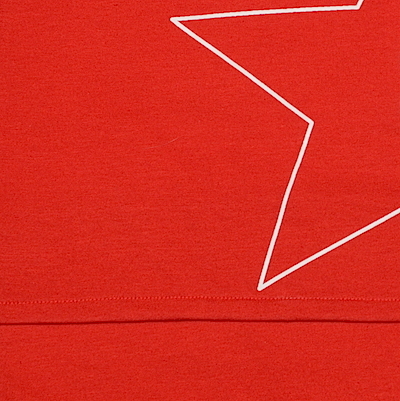 Above is a close up of the binding at the mitered corner on the t-shirt quilt. 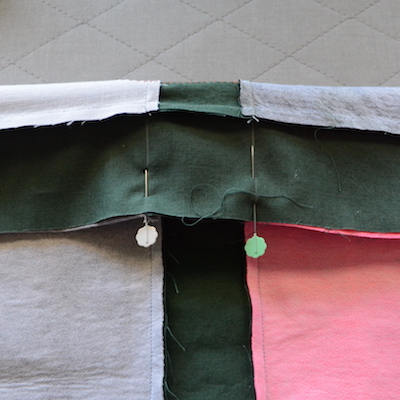 I sew the binding on to the back of the quilt, and flip it to the front. Then machine stitch the binding in place using the Flat Fell pressure foot by Janome. 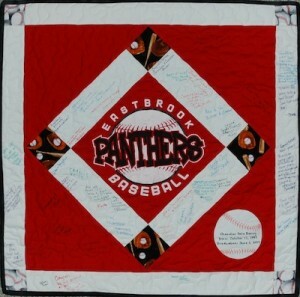 Above, is what the stitching looks like on the back. Sorry that it is red on red, but my client wanted red sashing, border, back, and binding, so I hope you can see the thread. 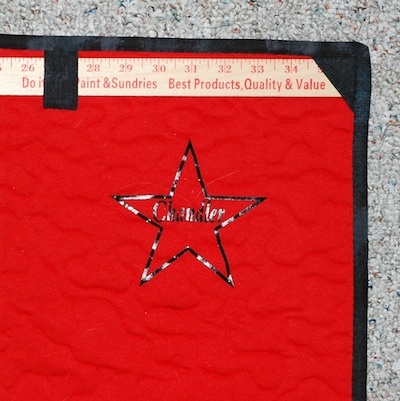 The stitching is just about 1/8″ beyond the binding. Machine stitching on a binding is my favorite method for attaching bindings. No more hand stitching for me. Too many quilts and not enough time for that hand stitching! Of course, I’m not entering quilts into shows, if so, I would be doing that stitching by hand. 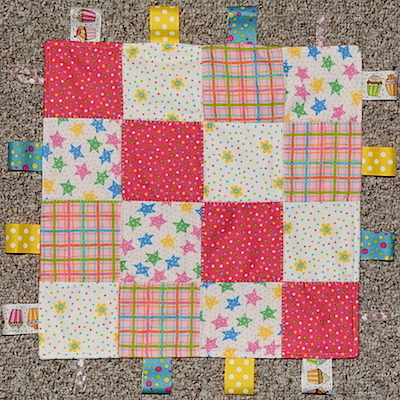 Another little accomplishment was stitching up the April block from the Sit Down Free Motion Quilters Facebook group. This month was paper piecing. Just one block. Jeanne Harrison of the Sit Down Free Motion Quilters Facebook group has lots of videos for the BOM offered in the group. If you have not tried paper piecing, you might want to join the group and take a look at her paper piecing method. Have you ever tried paper piecing? Do you like it? 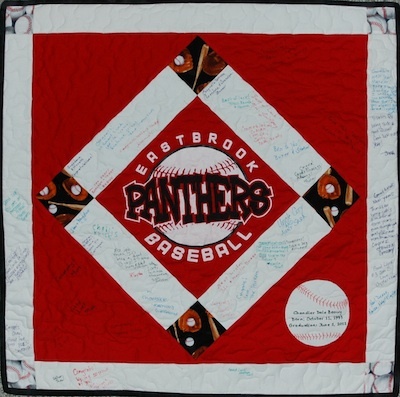 Get back to blanket stitching Fusion Blanket squares. ✔️ Slowly but surely, I’ll get those squares all blanket stitched. Need to work on OMG for April – charity quilts! ✔️ I think my goal was too big this month. But the month is not over yet! I have one charity quilt sandwiched and FMQ almost completed. Then binding, and the 2 more to do. Sit Down Free Motion Quilters April BOM pattern is up and ready. Paper Piecing this month. ✔️ Block pieced! Finish 3 charity quilts. Tops are pieced. Maybe backs, hope so. Sandwich, quilt, and bind. One is almost complete. 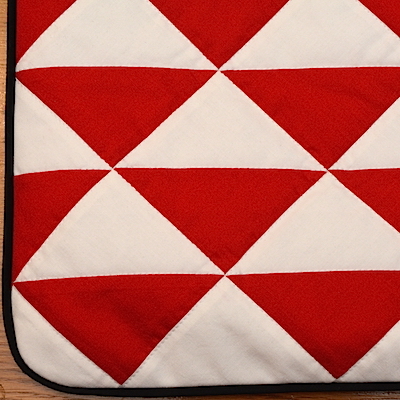 Keep plugging away on Fusion Blanket – blanket stitch squares. Just in time for Christmas, I have three finishes this past week. One was a rush t-shirt job for a customer. She had the shirts all prepped, so I only had to do the piecing with sashing. Then it went to the longarm quilter and back to me for binding. She picked it up Sunday and was pleased with the results. I was pleased to make a little extra cash right before Christmas! The second finish is the quilt I’ve slowly pieced over the past 2 years. 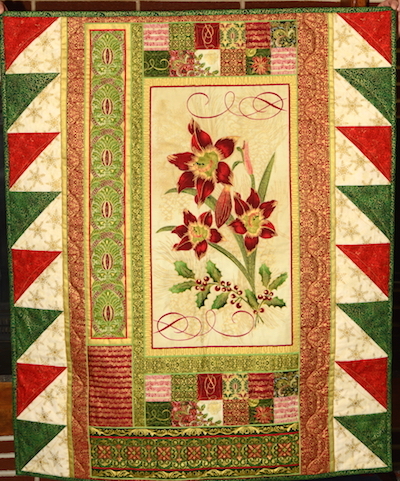 I only worked on it at my monthly quilting group – the Timeless Tradition quilt. 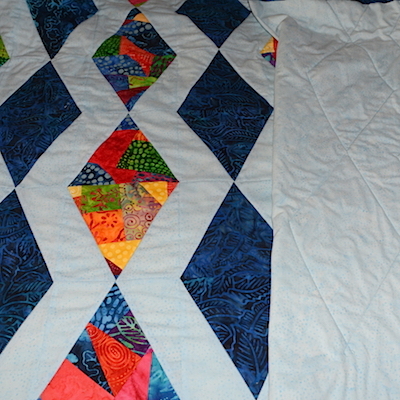 This past week I did the quilting on a friend’s longarm. It was so nice of her to volunteer the use of her machine for the quilting. I’m more used to sitdown quilting on my domestic machine, so it was a totally different feel using the longarm. Completely different process too, other than pulling the bobbin thread up to the top when starting to quilt! The quilt is in the mail to be gifted to my brother and sister in law for Christmas! And, I’m so pleased that I kept with my goal of using fabrics from my stash for Timeless Tradition! Even the border, back and binding, all from my stash! The third is a little quilt made from a panel that I added HSTs to the sides making it large enough for a wheelchair lap quilt. It is in the mail as a gift for my mother. I’ve added on more project to my Christmas to-do list! Crazy right? I wanted to make a little something for my daughter in law’s parent’s as they will be visiting from Arizona. After talking my ideas over with my daughter in law, we settled on a Christmas themed pillow. 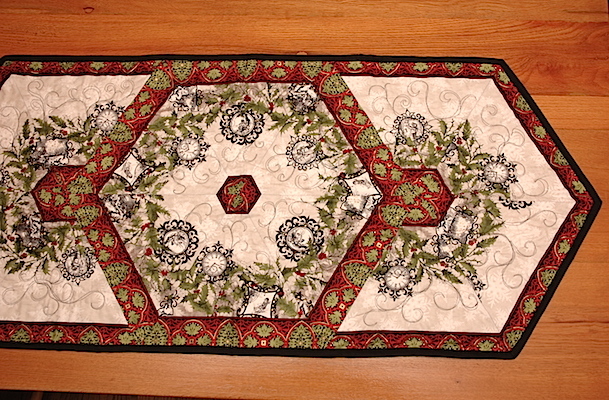 I just happened to have an orphan Wreath block that I am turning into a pillow. 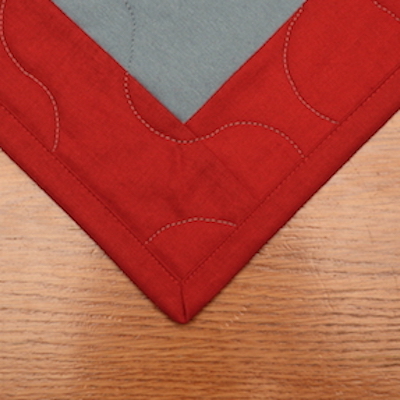 Next up – making red piping for the trim. Then I have grocery shopping and a little prep for our Christmas meals. I’m feeling relaxed and in control. How about you? Are your Christmas & Holiday plans coming together with out all the crazy stress? I hope so! How did I do on last week’s To-Do Tuesday List? Piece new t-shirt quilt ✔️ Pieced, quilted, bound, and returned to owner! Keep plugging away on Timeless Tradition appliqués. Hopefully get to borders. ✔️Completed, boxed and mailed today! Find that flannel for the pj bottoms! ✗ I might need to buy new fabric. 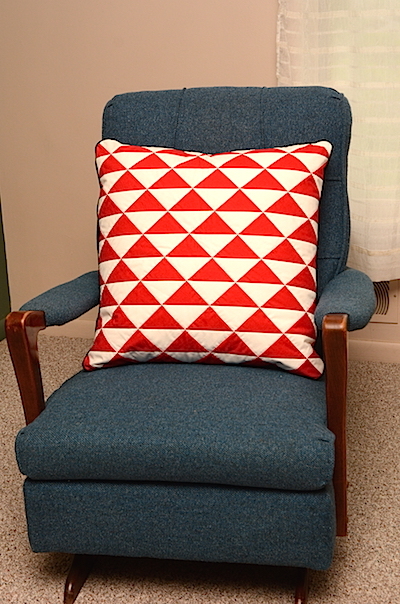 Finish a pillow to gift Christmas morning. Should be doable because I found an orphan Wreath block to use for the pillow top! Grocery shopping for Christmas day eats. Enjoy Christmas Eve with church family, and Christmas day with family! I have two projects that I’m making up as I go along. No patterns. The going has been slow. Project One: is a 24″ pillow. The front is made of HSTs on point. The white triangles will be used for signatures at a graduation party. 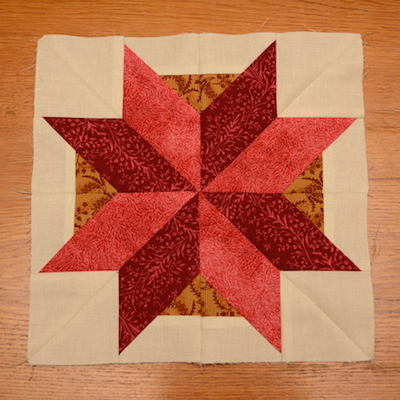 I used fusible webbing Pellon P44F to add stability to the pieced HSTs. It will keep the fabric from shifting and will make it easier for guests to sign the piece. The HSTs are quilted in-the-ditch in 50 weight white Auriful thread #2021, sandwiched with a thin batting and a piece of muslin. Black piping to frame the pillow. 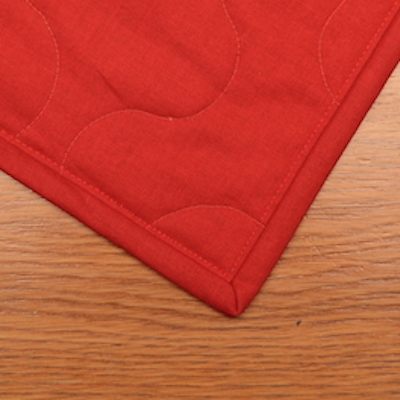 A red t-shirt was used to create an envelope closure on the back of the pillow. I asked last week if it would work to stuff a 24″ pillow form in a slightly smaller pillow case. The answer is yes! The pillow case is 23″ square. Top photo – Don’t you think it worked too? I won another drawing! Julie of The Crafty Quilter is holding a monthly drawing this year as incentive to complete UFO projects. These cute gifties arrived in my mailbox: A fabric & bead necklace made by Julie, Scraps ‘n Fats pattern, and Vintage Picnic Charm Pack. Thank you, Julie! Finish Signature pillow. ✔︎ Completed today! Bind t-shirt quilt. ✔︎ Bound, delivered, and paid! Construct Hobo bag. ✗ Started, not completed yet. Work on BOMs, Timeless Traditions, Machine Quilting Block Party, One Block Wonders if time allows. ✔︎- Kind of. On my sewing day with friends, I cut out 6 OBW blocks and got 3 of them pieced. 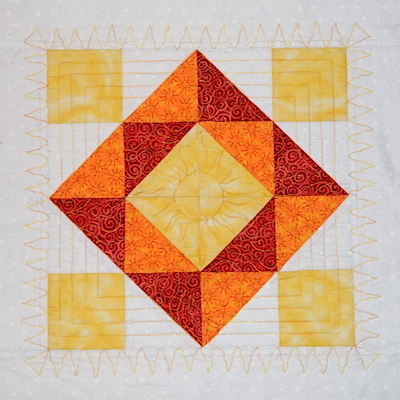 Work on BOMs: Machine Quilting Block Party and One Block Wonders May block. I’m keeping my list very short this week, as I don’t seem to be very productive lately. And, I really need to clean my house! Thing 1: Saturday, my family was invited to a baby shower. For some reason, I thought the baby was a boy, but nope, tis a girl. That meant a quick look around the studio for girlie fabrics. I usually make a self-binding baby blanket for baby showers, but didn’t have any girlie flannel prints in my stash, but I did find a kit for a baby tag blankie. Phew! Saved! I whipped it up Friday, and ran to the store to pick up a couple other baby items to add to the gift. I bought a chubbie baby book & a rattle/toy. When I was packing up the gifts, I was fearing that the mom might be one of those gals who hates pink! But when she opened it, she said pink is her favorite color! And her husband chimed in saying he has always wanted to learn to quilt. I told them my door is open if they ever want to come over to learn to make a baby quilt. So we will see if anything comes of that. Baby is due mid-April. I think they might be a tad too busy for quilting for a while! Thing 2: My middle married daughter wanted to make a simple quilt for their new king size bed. We shopped together for the fabric, and I cut out strips according to her design. She took them home and sewed the top together. Then she brought it back to me to quilt. When I saw how huge it was, I was not willing to try to straight line quilt it on my home machine. So it sat for a while, since last Fall! Talking with a friend, who happens to own a longarm, she told me to bring it over and quilt it on her longarm! (which I did in late February) This was my first time to quilt on a longarm, I was thinking straight line quilting on a longarm would be difficult. Turns out I was wrong! My lines are mostly straight, the hard part was setting them up at a 1/4″ from the seams, as my daughter requested. I should have used a ruler to measure each row. Some are 1/2″ from the seams! When my daughter was up last weekend, she said she loved it! Phew! The variety in the stitching coordinates well with the various fabric widths. My daughter selected a dark gray from my stash for the binding. Yesterday I wrestled the quilt into submission to bind on my machine! That was a work out! I’ll ask my daughter to take a photo of it on her bed once she gets it to her home, next weekend. I’m glad to have it completed, but really, too bad winter is over when she and her hubby should have been enjoying it! 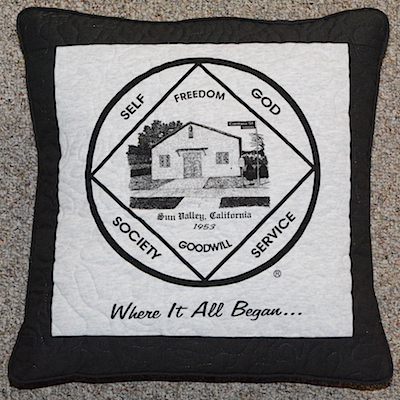 So, dear quilters, what have you forgotten about lately? Or are you so well organized you just don’t overlook projects? 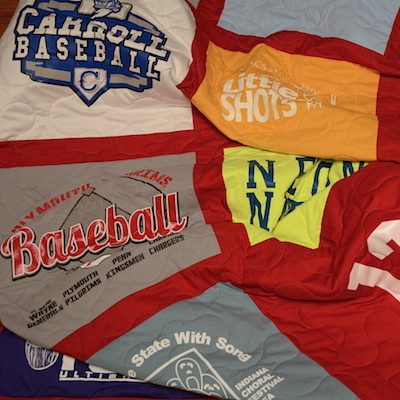 On to my planned projects from last week – The t-shirt quilt is complete! 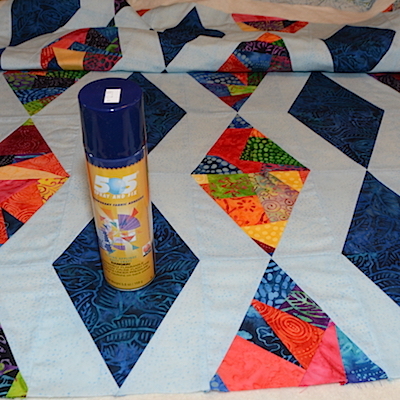 I love the geometric design the longarm quilter used for this quilt! Hoping my customer agrees! My Facets Quilt-Along quilt is finally getting some attention from me! Today I whipped up a back from the left over dark blue and light blue batiks, and had to add two more fabrics to make it large enough. (not photoed) Then I spray basted the sandwich using 505 temporary adhesive. 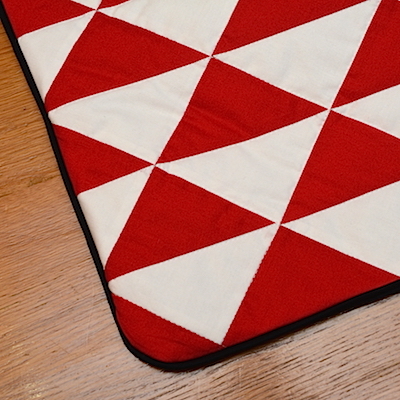 Using the Dual Feed with the Stitch-in-the-ditch foot, I stitched in the ditch around all the triangles. Next up is stitching 1/4″ from the seams in the light blue background fabric. I’m using Aurifil 2847 in the top and bobbin for the SITD and 1/4″ stitching. 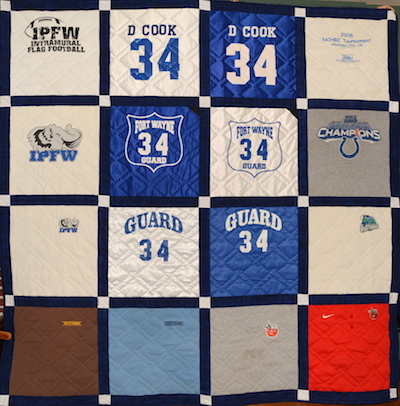 Bind the t-shirt quilt and deliver to customer. 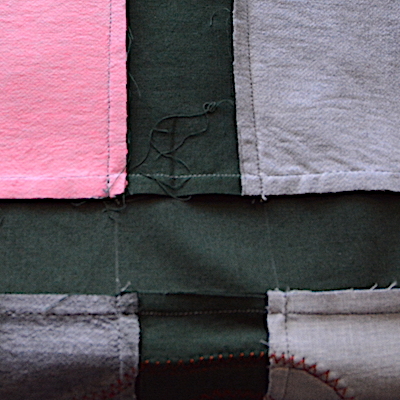 ✔︎ T-shirt quilt bound! Customer contacted, but we have not met up yet. Find a back for the Facets quilt. Sandwich! ✔︎ Just today, I sewed up the back, sandwiched, and stitched-in-the-ditch. Phew! Grocery shop! Kitchen is looking empty since I was gone last week. ✔︎ And even did some yummy cooking! If time always, I hope to spend some time on the Machine Quilting Block Party February block. ✗ Just not getting to this. Sigh. Continue quilting the Facets quilt. Shop and prepare my part for our family Easter Dinner. Maybe work on the Machine Quilting Block Party Feb block??? At least get it marked for quilting! I’m linking to Linky Tuesday and To-Do Tuesday. 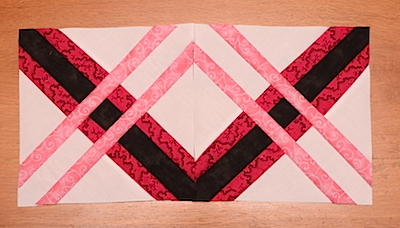 I started off February by making this month’s block in Leah Day’s Machine Quilting Block Party, Mystery Quilt Block #2. For the star points, I used the Lazy Girl No-Math Ruler technique. I’m using scraps from my stash for this BOM. I love the orange Grunge in the corners, which was leftover from another project. There might not be enough left to show up in another block. I’m challenging myself to NOT buy fabric for this quilt along, other than white for the background. I’ll be replenishing whites from the LQS at their next sale. I’m amazingly low right now on whites and creams. Below is January’s Block pieced and quilted. Leah’s Machine Quilting Block Party uses a Quilt-As-You-Go Technique. 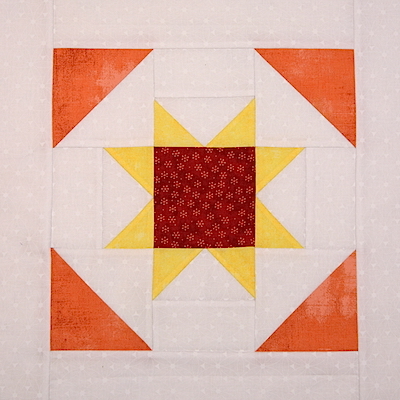 I have only made one quilt in this style, and Leah’s technique for joining the blocks is different from what I learned years ago. I’m looking forward to learning her process this year. Next are the two blocks I made for January’s One Block Wonders BOM. I have cut enough pieces to make a small quilt, but only got 2 blocks made. They will have to go into the WIP pile! Next are the fabrics I will be using to piece the improv part of Christa Watson’s Facets Quilt Along. I had leftover Batiks from another project, and since they are scraps, I thought they would be perfect for improv piecing. Next up are T-shirts prepped with Pellon fusible interfacing (P44F) and squared up at 16 1/2″. 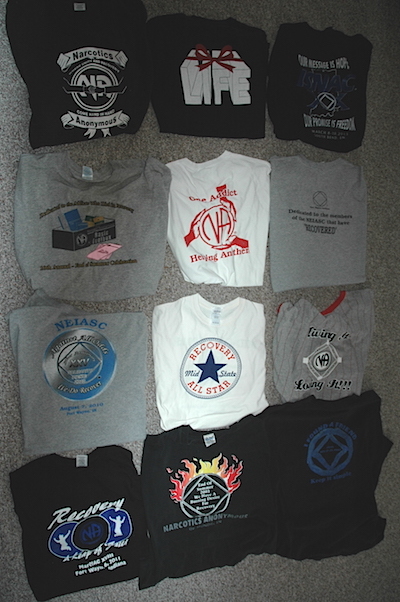 Using 16 shirts, I’m placing them in a 4 x 4 configuration. I need to shop for fabric for the sashing, corner stones, border, backing & binding. I’m waiting for the LQS sale that starts Feb 8th. How about you? Are you trying any new-to-you techniques this year? I’d love to hear about them! GOT to get to the January One Block Wonders, deadline Friday! ✔️Got 2 blocks made, and enough pieces cut for a quilt top. Finish FMQ Machine Quilting Block Party January Block ✔️ I’m pretty happy with how this block turned out! 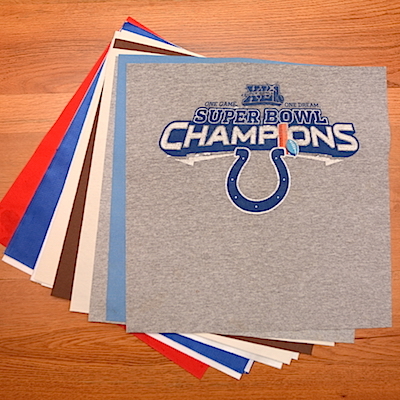 Prep those t-shirts! ✔️ The least fun part in the process of making a t-shirt quilt! Start a new customer quilt, it’s a Bargello with appliqué. King size! 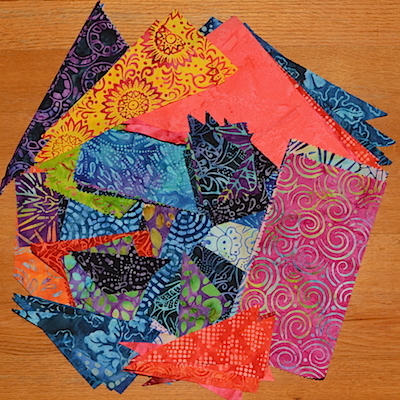 Start piecing the improv fabric for the Facets quilt. 2 Finishes the 2nd week of 2016! This year is off to a good start! The t-shirt pillow is finished, along with the t-shirt quilt. I picked up the t-shirt quilt from the longarm quilter on Saturday. Monday, I attached the binding and got started on the pillow. While working on the t-shirt pillow, I decided to sandwich the top with batting and muslin to meander quilt it, instead of just piecing with no quilting. I used 505 Spray and Fix temporary fabric adhesive to ‘baste’ the pillow top. I made piping for the outside edge of the pillow. After meander quilting the pillow top, I attached the piping, made the pillow back, and layered the front to the back. But they didn’t line up! Somehow I had messed up on measuring and cutting the top! It was 20″ x 21″ instead of the needed 20″ square! I had to rip the piping off and then trim the top and bottom edges of the pillow front to get the 20″ square. Then I reattached the piping! Phew! All finished! I used Superior Mono Poly for the meandering top thread, and Aurifil in the bobbin. 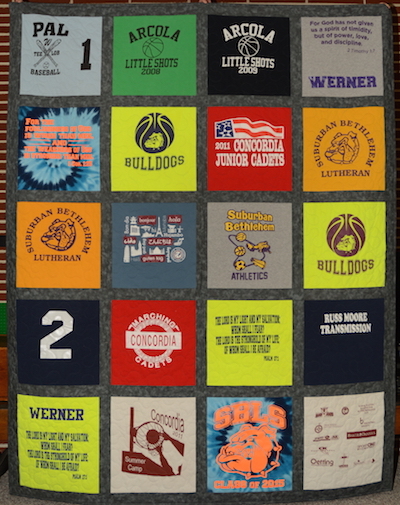 And the finished t-shirt quilt. The customer wanted a simple setting and guy type fabric. 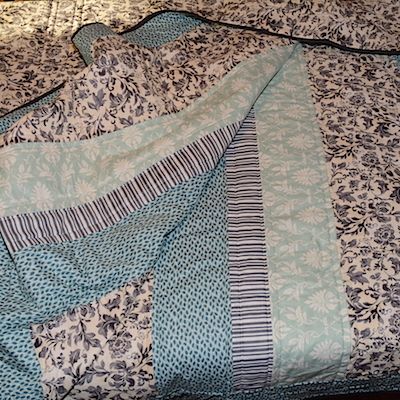 I used the same print in gray (see above close-up of piping) for the pillow, quilt border, back, and binding. And the same print in a light gray for the sashing. It is a Red Rooster Studio print. The longarm quilter said it was a great guy print with out any prompting from me. I hope my customer things so too! This week I plan on working on the quilt my daughter started and needs help squaring it up. ✔️ Squared up! But found it needs a border added. I have an order for a pillow to match the t-shirt quilt. ✔️ Finished it today! Also, I picked up the t-shirt quilt from the longarmer and have it squared up and binding completed! And I will take one of my WIP to my sewing day, either Dot-to-Dot or Curve it Up. ✔️I took along the Dot-to Dot and have the blocks completed, sashing cut, and piecing of sashing underway. Add border to my daughter’s quilt. Call customer to pick up her t-shirt quilt and pillow. Work on One Block Wonders January block. 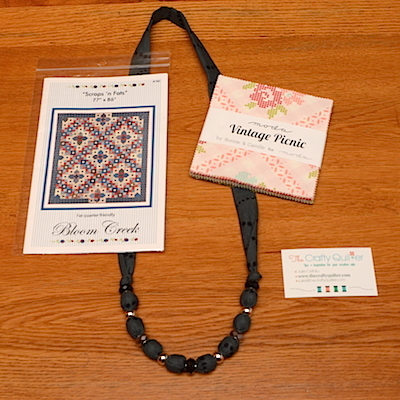 Have you ever shopped online from Craftsy? I have. I like their merchandize, sales, and service. Last Thursday, instead of taking the Metro Hoops WIP along to my sewing group, I took some precuts purchased from a recent Craftsy order. I was thinking I’d make some hexagon hot pot holders. But once I got the hexies sewn together, I decided they need to be a quilt top instead. I showed my friends how to do a partial seam for sewing the hexies. I was surprised none of them knew this technique! My friends all loved how the hexie blocks turned out, so we went to Craftsy and put together an order. 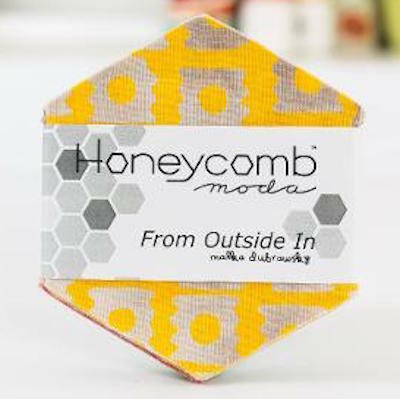 I ordered 2 more sets of Moda’s Honeycombs. 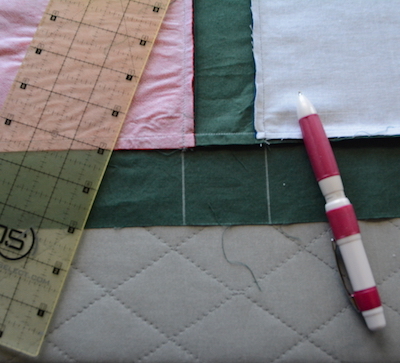 Continuing – I also took along some 2 1/2″ precut squares and stitched up the beginning of a table runner. The Craft Bazaar I attend last Saturday with two longarm quilting friends was fun. They wanted to make their services known to the public, and this was a good start. One has gotten 2 orders for Christmas decorations she had displayed. I finished all the binding for one friend and she had those displayed as well, but none sold. I suggested they both open Etsy shops. As payment for the bindings I did, my friend tried handing off some money to me, but I told her if she thought it was fair, I’d be happy to barter for the Christmas table runner. She agreed, and this beauty is now in my possession. 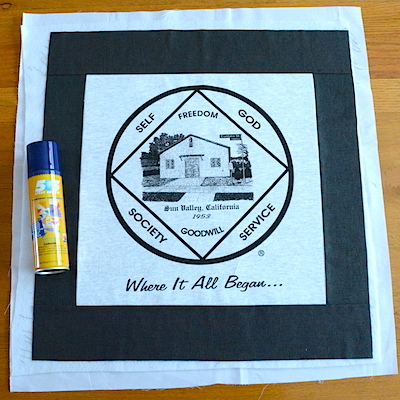 The third new project is another t-shirt quilt. This is just a quick shot to follow for the placement of the shirts. They will be sashed in gray, than a border in cream, 2nd border in the same gray. Binding and back will also be in gray. The fellow just wants a very simple quilt. It will be simple, but I think still pleasing, and the t-shirts will remain the stars in the quilt. This week my To-Do List will be working on the t-shirt quilt. 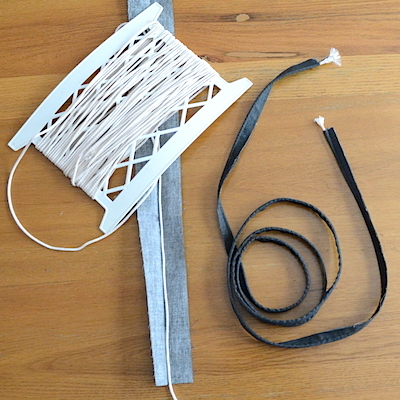 First up will be shopping to find the right gray for the sashing. Wish me luck, as grays are hard to find at the local shops. Graduation party gift. Guests signed the top before it was quilted. Note the yardstick and corner tabs for hanging the quilt. 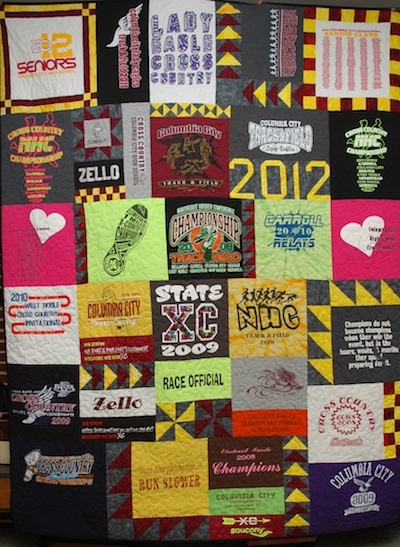 Graduation time brings the request for t-shirt memory quilts. 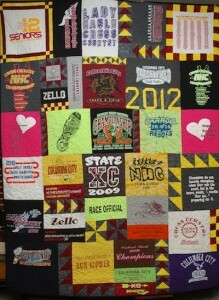 Here is one made for a Cross Country and Track & Field high school graduate. About 27 t-shirts used. 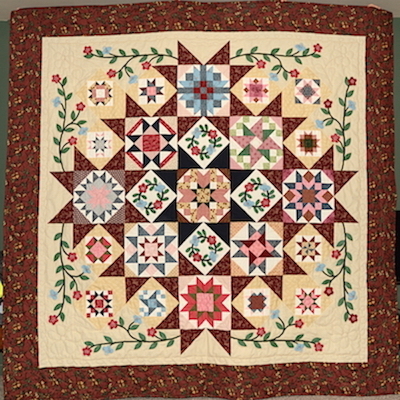 Quilt is 64″ x 82″.